The sharp-shooting air gun is easy to use and also has an extra barrel with four backup darts, so you'll have plenty of back-up ammo. And it looks the business too. If it was painted silver or black, you'd almost believe that it was a prop from a sci fi movie. This toy can be played indoor or outdoor - although, if you go for the indoor option, we still strongly advise removing any favourite ornaments and other breakables, because these things do pack enough punch to send items of value flying. The automatic disc launcher has two settings that allow the discs to be launched a few feet or up to 25 feet depending on your environment. 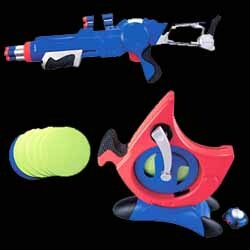 All in all, we found that this item is really designed more as an outdoor activity, as the discs and darts are still likely to cause damage if you are not careful, and the launcher makes a little too much noise - which is likely to annoy any grownups in the vicinity. It's not as easy as it look either - hitting those targets takes a lot of practice. This is ideal for parties and can be enjoyed by both adults and children alike. For £30, this is well priced and well constructed.